We are committed to energy savings, we harness residual heat and generate sustainable energy with the sun, wind, water and soil. Any new initiative in the region is tested against our standards for achieving an energy-neutral region. By 2030, the Cleantech Region aims to be energy-neutral and waste-free. We invest in a sound housing and business climate in our inner cities and town centres. Locations with high vacancy or looming degradation are prioritised. We balance housing, working and facilities. We use cleantech measures for clean and green cities and centres. A good accessibility to and in our region with clean and sustainable mobility. That is our goal! Widening the A1 motorway, good public transport and a smart spread of regular and commuter traffic: we work towards a clean traffic and transportation system in various ways. Sustainable and energy-neutral production while minimising waste: that is how we achieve better performance and higher productivity. New applications, products and revenue models in cleantech reinforce our economy. We stimulate innovation and roll out the red carpet for current and new cleantech entrepreneurs. In order to fulfil our cleantech ambitions, entrepreneurs are in need of well trained and qualified employees. That is why we are pushing for a sustainable labour market in great synergy with education. We strive to attain the lowest unemployment rate in the Netherlands. We are the Cleantech Region and are recognised as such inside and outside our region. Cleantech Region is a partnership and an area. Two organisations spearhead our Cleantech Region: The Strategic Board Stedendriehoek and the Stedendriehoek region. A clean future and a strong business climate: that is how we bring prosperity and well-being to our region. These common motivations are what joins together governments, entrepreneurs, education and research bodies in and around the Cleantech Regio. 10 percent less CO2 emissions/less use of fossil fuels by 2020. The seven collaborating Stedendriehoek-municipalities of Apeldoorn, Brummen, Deventer, Epe, Lochem, Voorst and Zutphen work from a shared belief that together more can be accomplished. They are focused on: accessibility, liveability, innovation and social capital. Together, these municipalities carry out The Agenda Stedendriehoek. The municipalities work together based on the Intermunicipal Statutory Regulations Act (In Dutch: Wgr) and collectively form a Wgr region. 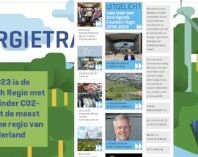 Collective focus: working on behalf of the Environmental agenda.Together with Gelderland province, the Strategic Board Stedendriehoek and the Stedendriehoek-municipalities established the Environmental Agenda Cleantech Region. From this Environmental agenda, all partners work on joint themes that reinforce and overlap each other. Themes that call for an extra effort by governments, entrepreneurs, education and research. Collective focus is what drives tempo. This process also has us closely working with the Overijssel province. We are open to explore new opportunities to cooperate with other European cities, regions, businesses and organizations. We want to learn from our partners, share experiences and best practices with other innovative cities and regions and work together in European funded projects on the common goal for a clean future. We offer a fieldlab environment to facilitate innovation and have a hands-on mentality. We translate our ambitions to concrete actions so we can learn by practice. We welcome you to join us to work together on European projects. We are member of the European networks ERRIN (a.o. energy), ACR + (circular economy) and Climate KIC (climate) and use these networks to exchange ideas, find new partners and start European projects. Cleantech Region furthers the initiatives and ideas of citizens, entrepreneurs, education, research and social organisations. Together, we accelerate our region through a focused and joint pursuit of our ambitions. Tables inspire us. Cleantech Region Development is the administrative organisation of the Strategic Board Stedendriehoek for cleantech business cases, energy transition and the labour market. By furthering and connecting ideas, product innovations and partnerships, we accelerate cleantech development in our region. advisory: where are the opportunities, what should we take up? signalling: what relevant (inter)national and regional developments are influencing cleantech and our Cleantech Region? We have both temporary and structural tables. Table companions include representatives of corporate life, governments, trade associations, social organisations, education. They are the ones who arrange for broad support and capacity in their constituency. Table composition varies per theme. the temporary table ‘vacant farm buildings’ placed vacancy in rural areas back on the map and closed the table by holding a congress. the temporary table ‘housing quality’ published 'Quality programming in the Cleantech Region' in 2016, a useful tool for municipalities.